A missing tooth can be the source of embarrassment. It can make people reluctant to smile for fear of exposing what is a very visible flaw. Missing teeth can also be damaging for your dental health. The hollows left by missing teeth can be breeding grounds for decay-causing bacteria. Gaps in the teeth can also encourage existing teeth to lean, causing painful interruptions in the bite, which could even cause the painful jaw disorder TMJ. Missing teeth can also be the cause of facial tissue sinking and loss of profile. For these reasons it is important to replace the missing tooth as soon as possible and a dental implant is the most secure method of doing just that. 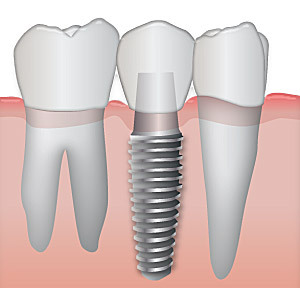 A dental implant takes the form of a tapered cylindrical screw that is anchored into the jawbone. This acts as a solid base for a post and artificial tooth, or crown, to be attached. They work particularly well for patients who have strong and healthy jawbones and teeth. Because they are so solid dental implants do not prohibit the eating of certain foods that other dental substitutes can. Neither do dental implants require any kind of messy dental bonding or adhesives. A dental implant will take two or three sessions to fix. There will need to be a two or three-week wait after the screw has been implanted to allow the screw and the bone to fuse in a process called osseointergration. On subsequent visits the dentist will attach the post and crown. A dental implant is the most realistic substitute for a real tooth. Many patients opt for implants, despite the extra cost, because of the feeling of security and permanency they provide. If you have a missing tooth, or are considering changing an existing artificial dental appliance, visit a dentist and ask about dental implants. A dental implant is a relatively new solution to missing teeth that involves drilling a small screw into the jawbone itself to act as an anchor for an artificial tooth. 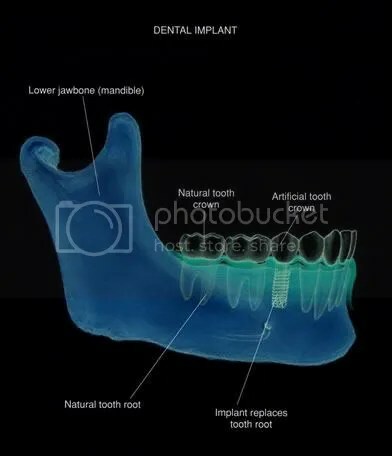 Because the implant is attached to the jawbone, it creates a similar feeling of stability to a real tooth, which is secured by a root.This procedure according to the experts is ideal for one or more individual teeth that have been knocked out, putting an implant in also improves the chances of not getting jaw bone decay due to a missing tooth. A damaged tooth such as a discoloured, chipped or misshaped one is a good candidate for being replaced by an implant. The implant is usually made from titanium or other lightweight but strong metal. Once placed into the jaw at the initial appointment it is left for several weeks or months to fuse with the bone and tissue in a process called osseointegration. When the implant has fully fused, the dentist will replace the temporary crown with a permanent one and it will look and feel exactly like a real tooth. Solid, comfortable and able to endure any food that you care to eat, a dental implant really is the closet thing to a real tooth and can put an end to any anxieties experienced with other dental substitutes. Dental implants are as close to real teeth as are available. Because the root of the implant is secured to the jawbone like a real tooth, it acts and feels like a real tooth. If you have a missing tooth or are looking to replace an earlier dental substitute, make an appointment to see a dentist.For more information call Goma Dental At 177-645-0704. We recommend dental implants to nearly all of our patients who are missing teeth. There are several reasons for this.For patients suffering the embarrassment of a missing tooth, dental implants are increasingly becoming the procedure to turn to. While other options exist, implants are preferred because the artificial tooth supported by the implant offers the most realistic alternative to a real tooth. It also offers a greater degree of stability than some of the less permanent dental procedures. Implants offer a permanent aesthetic solution to missing teeth – Implants can be used to give better support to a dental bridge for the replacement of multiple missing teeth, and can also be used with dentures to increase stability and minimize gum tissue irritation. Implants are low-maintenance – You can brush and floss an implant just as you would a natural tooth. No extra tools are necessary. Implants will not decay – This is also true of dentures and bridges. However, dental bridges are built upon your natural tooth enamel, which will continue to be susceptible to decay. Implants preserve jawbone structure – A missing tooth will eventually lead to further dental complications. This is inevitable. With no tooth or root to stimulate the surrounding tissue, that surrounding tissue will deteriorate, causing adjacent teeth to shift toward the gap. Implants are the most cost-effective solution – The initial cost for a dental implant can be steep. However, the cost of multiple dental visits associated with denture replacements and bridge replacement procedures often exceeds the cost of an implant. We offer a variety of financing options that make the dental implant procedure affordable to nearly everyone. The sooner you seek treatment for your missing tooth, the better. Just about anyone with one or more missing teeth is a candidate for implants. A consultation with a qualified implant dentist will be necessary to determine your candidacy.This procedure has one of the highest success rates in dentistry, but all are not eligible to get a dental implant done. If you live in the Shimla area, please contact Goma Dental today to arrange a consultation. Dental implants in India have become a very popular choice for many patients who would like to replace missing teeth with the most natural option possible. It’s easy to understand why dental implants have become very popular these days. Implant dentistry is highly predictable, offers greater flexibility with regards to treatment possibilities, and can give patients fully functional teeth in as short as an hour with minimum discomfort and pain using a local anesthetic with or without sedation. Dentures do not answer your problems of chewing and facial distortion over the years. On the other hand, dental implants offer a permanent solution for your missing teeth actually mimicking your natural teeth. Surgical operations included in putting dental implants also include restoration of a bone-like structure where the implant can be placed. It is because of this that dental implants can help prevent additional tooth loss and a sunken facial appearance. 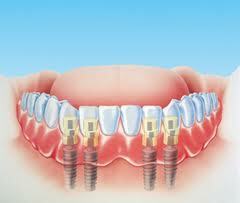 The most significant part of dental implants is that it can be operated on people of any age. Moreover, if you are consulting, any of the experienced implant dentist in India, it might not take more than an hour for your whole procedure. A dental implant is an artificial tooth root replacement and is used in prosthetic dentistry to support restorations that resemble a tooth or group of teeth. 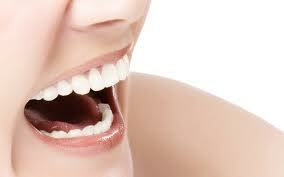 In simple terms it is a tooth, usually artificial, that is anchored in the gums or jawbone to replace a missing tooth. After remarkable advances in dentistry in recent years, dental implants have become the treatment of choice for people missing one, a few, or all of their teeth, and for those with failing teeth or severe periodontal disease. 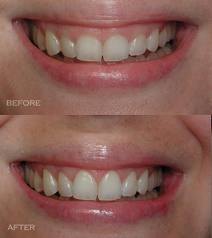 Dental implants look and perform more like natural teeth. They are rooted in the bone, there is no artificial plastic on the roof of the mouth, and the need for adhesives and denture creams is eliminated. More important, the use of dental implants does not impact healthy, adjacent teeth.The major classifications are divided into osseointegrated implant and the fibrointegrated implant. In 1952, Prof. Per-Ingvar Brånemark of Sweden conducted an experiment where he utilized a titanium implant to better understand blood flow in bone. At the conclusion of the experiment, he discovered that the bone had integrated completely with the implant. Brånemark called the discovery “osseointegration,” and saw the possibilities for human use.The procedure was first implemented in dental implants and now is used for cranial and maxillofacial reconstruction as well.After years of careful research and study, dental implants were refined with high success rates. There are patients now who have had implant-supported teeth for more than 40 years! Some current research in dental implantology is focusing on the use of ceramic materials such as zirconia (ZrO2) in the manufacture of dental implants. Although generally the same shape as titanium implants zirconia, which has been used successfully for orthopaedic surgery for a number of years, has the advantage of being more cosmetically aesthetic owing to its bright tooth-like colour. 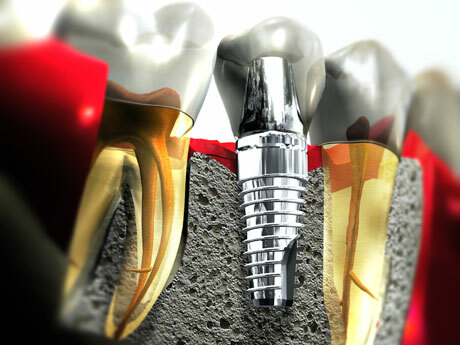 A typical implant consists of a titanium screw (resembling a tooth root) with a roughened or smooth surface. The majority of dental implants are made out of commercially pure titanium. Grade 5 titanium, Titanium 6AL-4V is believed to offer similar osseointegration levels as commercially pure titanium. Implant surfaces may be modified either by plasma spraying, anodizing, etching or sandblasting to increase the surface area and the integration potential of the implant. This procedure has one of the highest success rates in dentistry, but all are not eligible to get a dental implant done. Consult your dentist who will take your history and examine your teeth and gums to consider you for this restorative procedure.For more information call Goma Dental at 177-645-0704.